In this lesson, we will learn how to multiply by 11 and 12 using objects and the multiplication table. If 1 1 × ⧫ = 3 3 and ⧫ × ■ = 8 1 , what is ■ ÷ ⧫ ? There are 12 trees in a garden. There are 4 oranges on each tree. Nabil writes this equation to find out how many oranges are in the garden. Which symbol is missing from his equation? How many oranges are there? The price of a stock decreased $3 per day for eleven consecutive days. What was the total change in value of the stock over the eleven-day period? A coat costs 12 times more than a pair of shorts. The shorts cost $7. 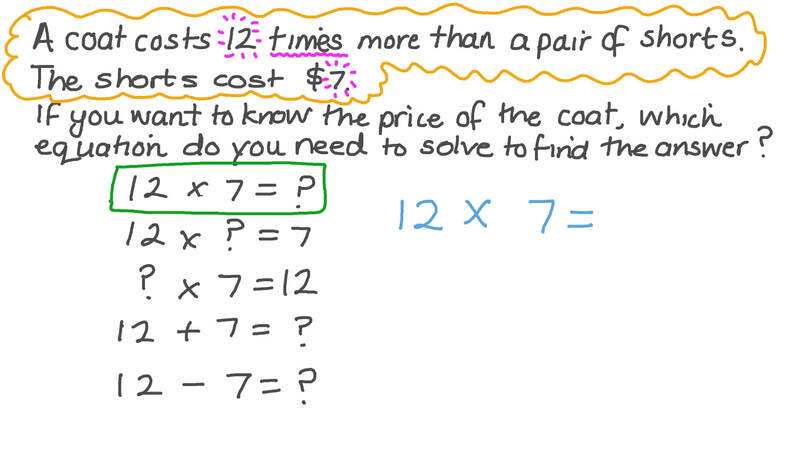 If you want to know the price of the coat, which equation do you need to solve to find the answer? A 1 2 × 7 = ? B 1 2 − 7 = ? D 1 2 + 7 = ? Baby monsters have 12 teeth. Adult monsters have 24 teeth. Each monster also has 4 legs. How many teeth do 7 baby monsters have? A rectangle has side lengths of 7 and 12. 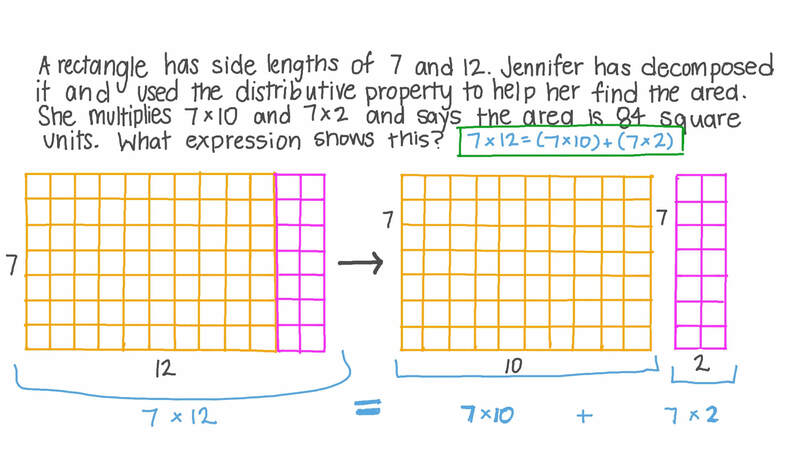 Engy has decomposed it and used the distributive property to help her find the area. She multiplies and and says the area is 84 square units. Sally had an end-of-the-year celebration for her employees. It cost her $7 per employee for food and $1 per employee for an end-of-the-year souvenir. 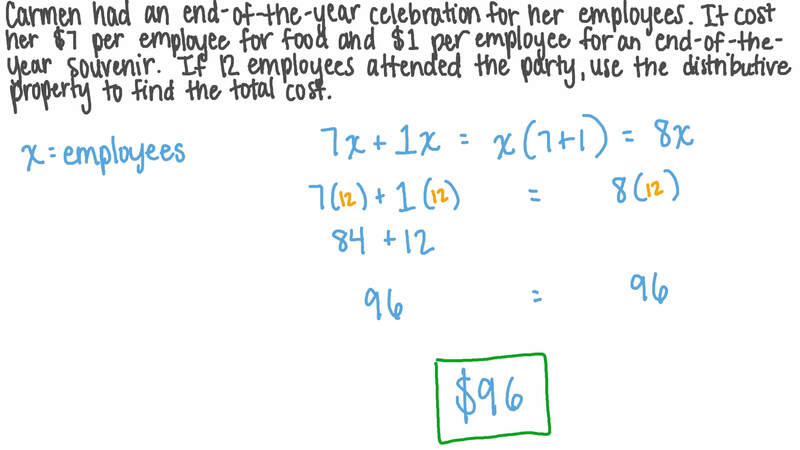 If 12 employees attended the party, use the distributive property to find its total cost. A student went to buy some stationery. He purchased 9 dozen pens and 16 dozen pencils. Determine the total amount of pens and pencils purchased. If tickets to a movie cost $14 each, and a serving of popcorn costs $7, use the distributive property to mentally calculate the cost for 5 tickets and 5 servings of popcorn. Find the missing numbers in the table. A student went to buy some stationery. He purchased 6 dozen pens and 11 dozen pencils. Determine the total amount of pens and pencils purchased.